Strings Aloud combine passion, energy, and superb musicianship to their performance and will captivate any audience This Quartet creates a rich yet versatile sound with a fresh approach and huge repertoire which contains Classics, Modern and favourites. Established in 2005 by Mairi Hunter. 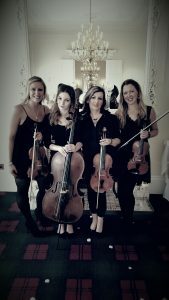 Strings Aloud are wedding specialists performing in venues across Glasgow, Edinburgh, Stirling, Perth and Ayrshire. With an extensive and constantly evolving set-list They perform Classical Favourites, Popular music, Jazz standards and Scottish tunes along with seasonal music. Comprised of highly skilled and experienced professional musicians Glasgow based Strings Aloud is guaranteed to compliment any event and add a touch of class to the proceedings. They specialise in providing music of the highest quality, for weddings, corporate events and pride themselves on their presentation and offer a friendly, tailor made service. They know how important every aspect of your big day or private event is. They will add a truly unique atmosphere to any occasion including Session Work.